I have seen many lead train figures for tinplate scenes. Were there any seated figures made for 418 series cars, state cars or Ives 200 series cars? Many years ago I saw a ( heavy rubber? ) seated passenger figure with a knob on the bottom, that I think might have fit a standard gauge 418 car seat. The 418 seats have a hole in the seat itself. I know Dorfan cars had passenger (head and shoulders) in their car windows. Lastly anyone make window inserts with color passenger silhouettes similar to the old "O" scale William's heavyweights? I would like to "populate" some of my cars for fun. You can still get Marx 3/16 inserts for their NYC and Santa Fe passenger cars from Robert Grossman. I don’t have any photos at the moment but I have used G scale figures for scenes around the layout and sprayed them with a high gloss polyurethane to give them that shiny metal look. Beep People Seated from RMT. Haven't tried them in a passenger car but they are relatively inexpensive. Joe Mania has cast metal seated figures for standard gauge trains and trolleys. There are also tons of G scale figures available if you can tolerate plastic. I actually mix the scales of people where it's seems appropriate. After all, in real life there are people of all sizes. Actually the figures that I reproduce are copies of the figures that Lionel offered for trolleys and day coaches. They are polyester resin, not metal. I ASSumed. Thanks for clearing it up! I use LGB Orient Express seated figures in my state set cars and they fit pretty well in the metal chairs with a little tilting. I also add additional LGB seated figures, and they look great in the lighted cars. Of course, I do NOT mind the plastic figures, as I am also a huge LGB fan! The beep people in O scale are too small ( alot like the heads in the Dorfan cars), I have a few. I'm going to continue to search for COLOR silhouettes and maybe just populate the window frames not the seats. I dont think the O scale black silhouettes as used in the " Irvington/Madison " cars of Lionel or the Marx cars would be as eye catching as the color ones used by Williams. Of course the William's ones would need to be photo enlarged to almost G scale dimensions. Best Regards to you all. I' ll check back if I find a source and solution. Anyone know a source for the William's color silhouettes? I should soon receive a Standard Gauge 10-car Olympian Hiawatha consist from Jim Waterman and am considering installing color silhouettes in some of its windows. A 10 car standard gauge Olympian Hiawatha consist? Our language needs a new word for SPECTACULAR! Photos PLEASE! Preiser makes plastic 1:32 scale seated figures. Should work. I agree! We need a new word! If Jim Waterman doesn't post photos I will right after I receive the cars from him. Jim has matched the paint scheme for the cars with the orange/maroon/black livery used on the MTH/Lionel Super 381 since the bipolar was used to pull the train over the electrified sections of the Milwaukee Road's mainline to the Pacific. 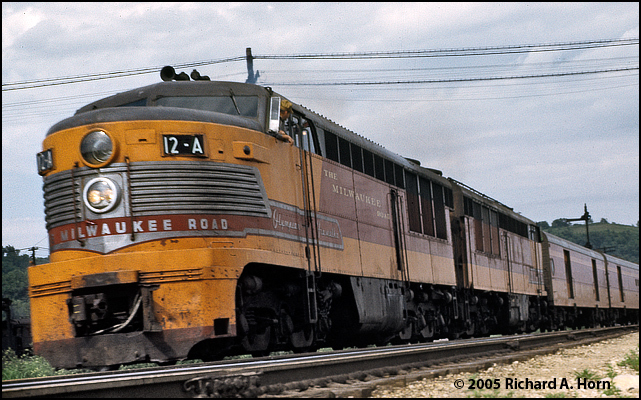 However, I would love to also have an Erie-built diesel locomotive to pull the consist since that was the original locomotive used to pull the Olympian Hiawatha over the non-electrified sections of the Milwaukee Road's mainline to the Pacific. Does anyone know if one has ever been made in Standard Gauge? If not, maybe I (we) can talk Jim into printing up an Erie-built shell for me (us). Great idea and I would use them but the cars Jim builds have no interiors just opaque windows as evident in the photo below of a passenger car which Jim built and had on display at the SGMA breakfast meeting during York. However, William's color silhouettes enlarged to Standard Gauge size and located immediately behind the opaque windows might work. What do you think? Should work. Also, as nice and as well executed as the German made Preiser figures are, they are about as costly as the LGB, although the LGB, at about 1:24, look better in my state cars. 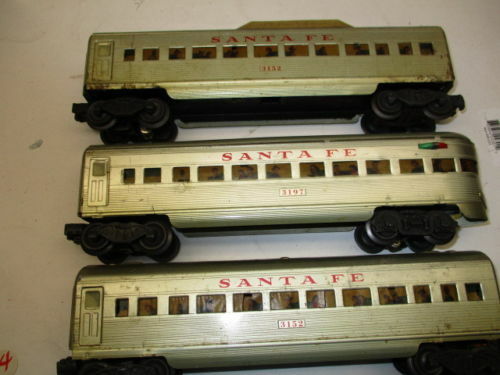 The LGB Orient Express figures are dressed in 1920's couture, and look especially good in vintage heavyweight coaches. LGB 51406 american seated figures is another good set. At $25 a set for 4 figures the budget is shot. Hence the color silhouettes are a more reasonable compromise. Now we just need someone to take a few close- up pics of the williams car windows or a full strip, and post them for us.